HCPCS code book always on sale! HCPCS book now in spiral format, AMA's official HCPCS book is your guide to Medicare's National Level II codes with all HCPCS 2019 codes, modifiers and deleted codes, and the most up-to-date information found in the HCPCS, MPFS and OPPS files. AMA's HCPCS Level II code book was good... now it's even better! 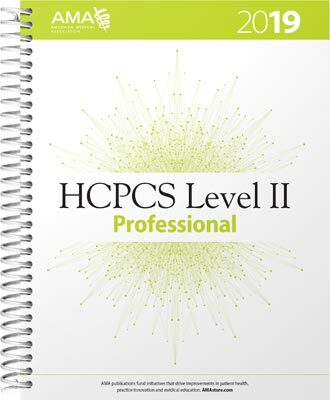 HCPCS 2019 Level II Professional Edition provides your practice a quick and accurate coding reference. Along with the most current HCPCS codes and regulations included in the code book, you'll have everything needed for accurate medical billing and maximum reimbursement. Organized for quick and accurate coding, HCPCS Level II 2019 Professional Edition code book includes the most current Healthcare Common Procedure Coding System codes and regulations, which are essential references needed for accurate medical billing and maximum permissable reimbursement. This professional edition includes such features as Netter's Anatomyillustrations, dental codes and ASC (Ambulatory Surgical Center) payment and status indicators. Full-color Netter's Anatomy illustrations — clarify complex anatomic information and how it affects coding. Special coverage information — provides alerts when codes have specific coverage instructions, are not valid or covered by Medicare or may be paid at the carrier's discretion.